We take the guessing out of booking a vacation rental home; our calendar is ALWAYS up-to-date! If this one is booked, be sure to check our other condos in Coral Reef Club. CONTEMPORARY STYLE MEETS BEACHY DECOR! Our large 3rd floor condo is a great place for your family to use alone or to share with friends. It is decorated with a beachy-contemporary flair, utilizing items such as galvanized steel pipes as curtain rods, clean lines in the tiles and decor with a splash of beachy colors and original commissioned artwork! The condo itself is open and airy with vaulted ceilings in the living room and expansive views from the kitchen and living areas. You will be pleasantly surprised by all the extras in our home that you would not normally find in a rental unit. No need to pack up your porta-crib, high chair, or sand toys, we have them all! And of course, it goes without saying; you will love the white sand Destin beach that is just outside your door! In our main living area we have two sliding glass doors with AMAZING beach views. There's an over-sized sofa with a coffee table, side table and lamps. There are also 2 swivel rocking chairs with reading lamp to sit and enjoy the expansive views. There are also two upholstered side chairs that serve a dual purpose-- they can be used chairs for gathering around together, or as a dining chairs. We also have a large flat-screen TV, DVD player and a blue-tooth speaker system. The balcony is likely where you’ll spend a fair amount of time so we made sure we comfy chairs to sit and enjoy your morning coffee, have an evening cocktail or just lounge all day watching the dolphins frolic in the water. Because the balcony faces directly south, you can easily see the beautiful sunrise to the east and breathtaking sunsets to the west. Even if you don’t like to cook, you’ll find inspiration in our kitchen with a dreamy view of the beach. We, of course, have equipped the kitchen with all the necessities such as a dishwasher, toaster, microwave, ice-maker, blender, ample plates, glasses and kitchen utensils. You'll also find a Keurig K-cup coffee maker, as well as a regular drip model. For your convenience, we supply many “extras” such as cleaning products, trash bags, aluminum foil, plastic wrap, sugar, creamer and spices. The Dining area features a table with custom made table . For the wee little ones we have a high chair. The Master suite has a King size bed with Egyptian cotton sheets, night stands, reading lamps, large dresser, large closet and HDTV. The window has room drapes . The attached full bathroom features a commode, vanity with sink, and a shared Jack-and-Jill style shower room with a tub/shower combination unit. The bathroom is equipped with a hair dryer and large fluffy bath towels, iron and ironing board. For the children, we have built-in bunk beds in the hallway. There is a door in the hallway so you can put the children to bed and not disturb them while you are still enjoying the living area and kitchen. There is a half bath on the main level with a commode and a sink. You also have access to Jack-and-Jill style access to the tub/shower room adjacent to the master bathroom. Also has a hair dryer and large fluffy towels. The 2nd floor FULLY-ENCLOSED loft bedroom has a King-size bed, with Egyptian cotton sheets, night stands, reading lamps, chest of drawers, closet and HDTV. This bedroom shares an attached Jack-and-Jill style bathroom which features a vanity with sink, tiled shower, hair dryer and large fluffy bath towels. The 2nd floor fully-enclosed loft bedroom has 2 Queen-size beds, with Egyptian cotton sheets, night stands, reading lamps, chest of drawers, and closet. This bedroom shares an attached Jack-and-Jill style bathroom which features a vanity with sink, shower, hair dryer and large fluffy bath towels. For your convenience, we also have a washer and dryer, and two irons and full-size ironing boards (one on each floor). And if you would like to keep up with friends, family or work while you are away, we provide free high-speed WiFi. Coral Reef Club is one of Destin's best kept secrets. It’s a low-density resort (only 3 stories which means fewer people on the beach!) 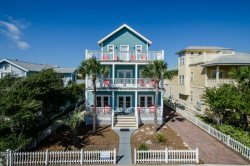 and is located on the dead-end of Scenic Gulf Drive, next to the Henderson Park Inn (which is an adult-only bed and breakfast which again means fewer people on the beach). * Walking distance to restaurants and very close to Publix and Fresh Market Grocery Stores, local attractions, golf, restaurants, and shopping. Note: Maximum occupancy varies depending your ratio of adults to children. Children 12 yrs and older are counted as adults. If you have more than six people, please call or email for clarification prior to booking online.